Daily routines are the foundation upon which our foundation routines are built. Though they can help carve out pools of sanity in our scattered worlds they are not enough to help take us from scattered to sane. We need to keep building on them. Keep that momentum going so we can create a more solid, well-rounded routine that will serve us well for years to come. 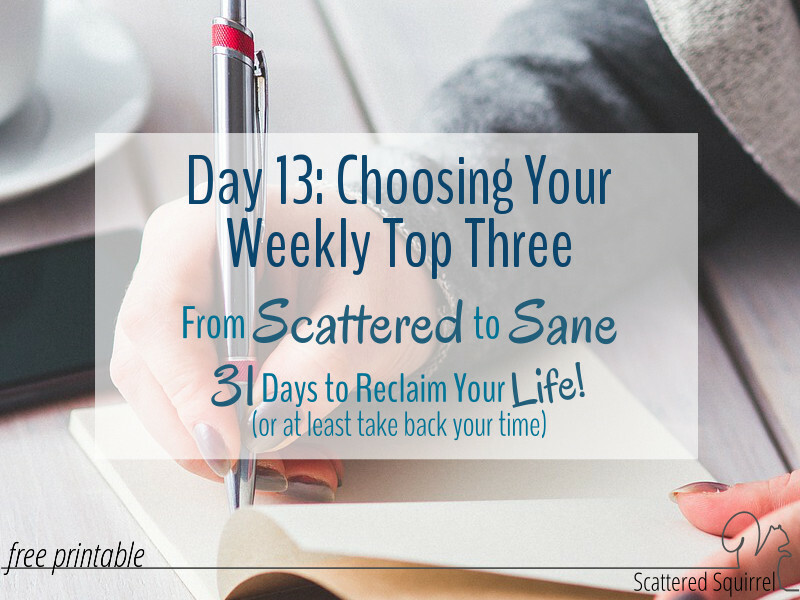 As I mentioned yesterday, the next step is to create a weekly routine, and we do that the same way as we did the daily routine, by choosing our weekly top three tasks. In yesterday’s post I asked you to take a look at the list of things you need to do in the life area you’ve chosen to focus on for this challenge and highlight or star any item that does not need to be done every day. I mentioned that that step was a good time to evaluate how often you do things, and whether or not you need to be doing them as often as you think. Today we’re going to be taking that list and just like with our daily tasks, we’re going to create our three item to-do list for our weekly takss. If you find it easier to work off a fresh list, grab a piece of paper and quickly jot down your non-daily items. I want you to take a few minutes to look it over. As you’re looking it over I want you to think about what weekly tasks you need to do to keep this area of your life running smoothly. Remember, this is just a foundation routine, the pieces that make up this foundation are the motions we go through when we’re going through the motions. This is the routine we fall back on when need to be in survival mode. When it comes to choosing your weekly top three tasks I want you to keep that in mind. These are the top priority items. These are the tasks that help you keep the order in this area. And so on. Baking and pet cages were tied for making it onto my list. I don’t ignore out pets, but this routine is about me and what I need to do and I only need to worry about cleaning one pet cage. Liam takes care of his hamster and is really good about remembering to clean his cage and I usually clean Quilber’s at the same time since everything is already out. On the other hand, I need to do the baking at least once a week so that the boys have snacks to take to school. 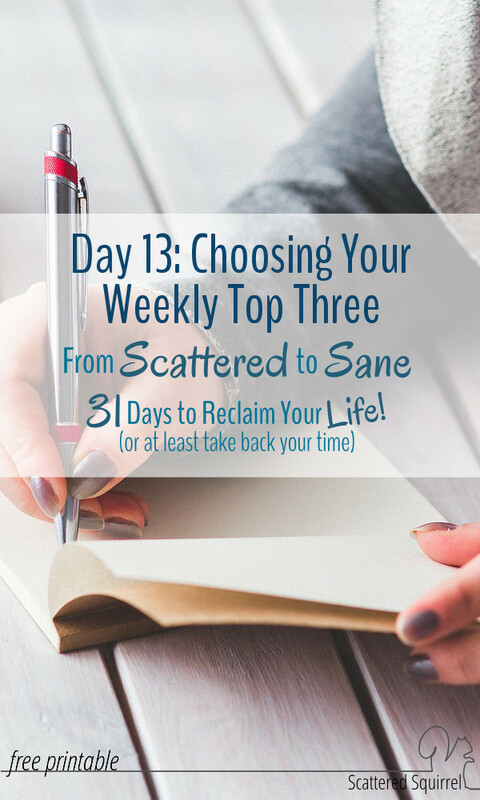 When choosing your top three weeklies it might be beneficial to look at those tasks from a few different veiw points so that you can choose the three that will be the best fit for you. 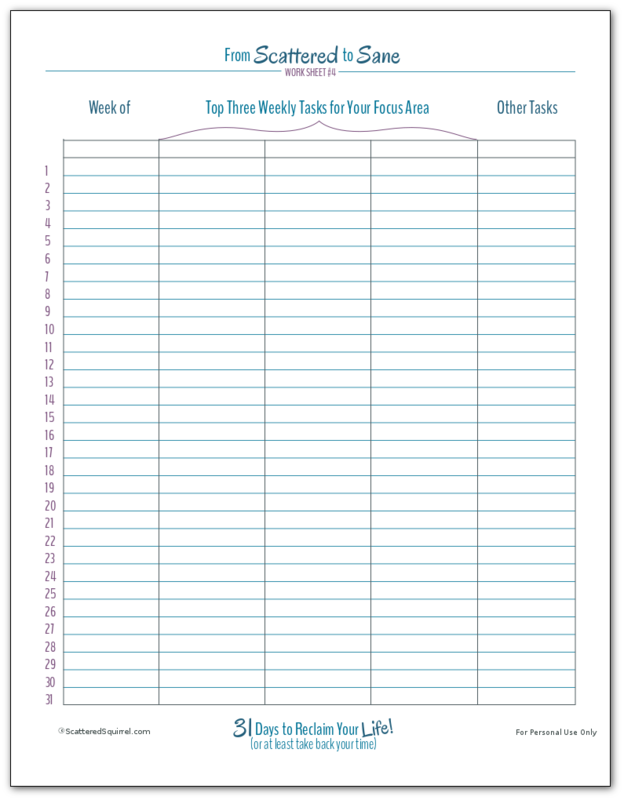 Once you have your three narrowed down, grab a copy of the work sheet below and use it to track your three things. It is very similar to the daily tracker. Write down the dates for the week so you know what week you’re tracking and log whether or not you’ve finished the task. I’m jotting down the day of the week that I do the tasks on so I can see if there is a day of the week that seems best for scheduling these items on, but you could just use a check mark or an ‘x’. Just like when building daily routines, the more you do your weeklies consistently the more second nature they will become. Since it takes between 21 and 28 days to create a new habit, I decided to try applying that same rule to a weekly routine which is why there is space for 31 weeks. Chances are you’ll create these new weekly routines in around 3 months, but for those that would like the extra accountability, it’s there for you. schedule these items into your planner. tie them to something you already do – like loading the washer before leaving for work in morning, or tidying your desk before you head home for the weekend. decide on a treat for yourself and a time frame for earning it – for example I’m taking an afternoon to myself if I can complete each of my tasks every week for three months. 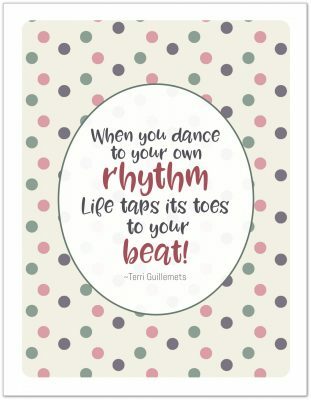 Remember that building these routines takes time and persistence. When we’re done we’ll have reclaimed a part of our lives and tamed some of our scattered-ness. I know it seems like a lot of work now, but I promise you that taking these little steps now and continuing to move forward will get us there. It can be tough, I know! I’m walking this path with you, building new routines myself, and some days are better and easier than others. That’s ok though. Don’t let a bad day or a few bad days keep you from moving forward. It gets easier with time. So, tell me, are your weekly top three tasks? Thanks for sharing these downloads. I’m just now getting around to other people’s #write31days and this is cool! I’m not sure only 3 will do me, but then again, I haven’t done your days 1-14. Maybe I should go back and check those first. May just keep me sane!